ford. Grizzly bears are the state animal of California. All four women who played today in the U.S. Open quarterfinals made splashes in the Bank of the West Classic at Stanford. No. 14 seed Madison Keys of Boca Raton, Fla., beat No. 30 Carla Suarez Navarro of Spain 6-4, 6-3 on another sultry day in Flushing Meadows, N.Y., after No. 20 Naomi Osaka of Japan overwhelmed lethargic Lesia Tsurenko of Ukraine 6-1, 6-1 in 57 minutes. Tsurenko told reporters afterward that she woke up today with a viral illness. 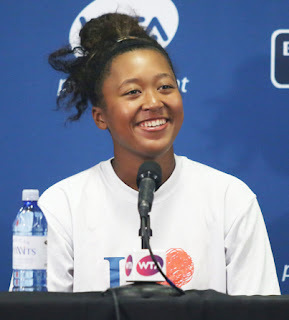 Osaka, 20, became the youngest U.S. Open semifinalist since Caroline Wozniacki in 2010 and the first Japanese woman to reach a Grand Slam semifinal since Kimiko Date lost to Steffi Graf in three sets at Wimbledon in 1996. Keys won the last singles title in the Bank of the West Classic in 2017, and Suarez Navarro teamed with compatriot Garbine Muguruza to earn the 2014 doubles crown at Stanford. Osaka's first big win came four years ago in the Bank of the West Classic. As a 16-year-old qualifier playing her first main-draw match on the WTA tour, she ousted 2011 U.S. Open champion Samantha Stosur 4-6, 7-6 (7), 7-5 in the opening round. Osaka saved a match point in the tiebreaker and overcame a 3-5 deficit in the third set. She then fell to No. 8 seed Andrea Petkovic. Tsurenko lost to Keys in the Stanford quarterfinals last year. The tournament moved to nearby San Jose under a new sponsor, Mubadala, this year. In Thursday's first semifinal (4 p.m. PDT on ESPN), No. 17 Serena Williams will meet No. 19 Anastasija Sevastova of Latvia for the first time. 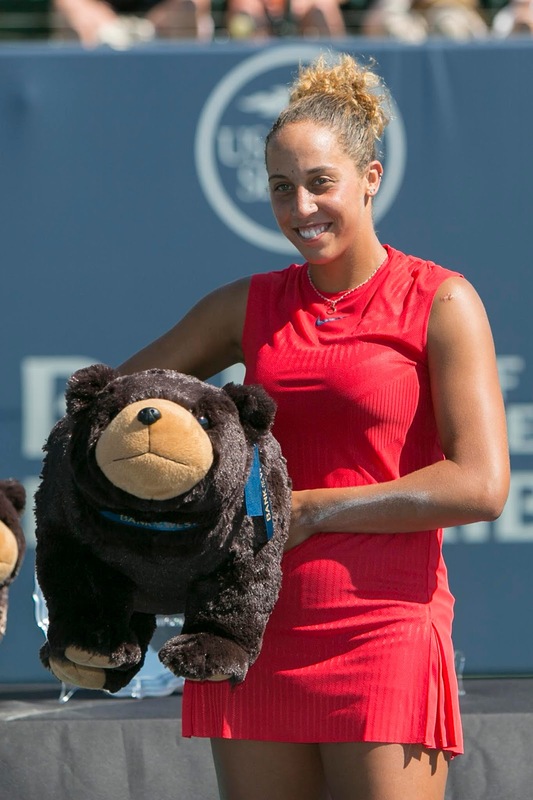 Then Keys, who was routed by close friend Sloane Stephens in last year's U.S. Open final, will face Osaka. Keys is 3-0 against Osaka, including a 7-5, 4-6, 7-6 (3) victory in the third round of the 2016 U.S. Open in their initial meeting. Williams, who has a residence in Silicon Valley, won the last of her six U.S. Open singles crowns four years ago. The three-time Bank of the West singles champion (2011, 2012 and 2014) can tie Margaret Court's record of 24 Grand Slam singles titles. In a men's quarterfinal today, No. 21 seed Kei Nishikori of Japan outlasted No. 7 Marin Cilic of Croatia 2-6, 6-4, 7-6 (5), 4-6, 6-4 in 4 hours, 8 minutes. Nishikori, who trailed 2-4 in the second set, avenged a 6-3, 6-3, 6-3 loss to Cilic in the 2014 U.S. Open final. Nishikori will take on No. 6 Novak Djokovic, a two-time U.S. Open champion, on Friday. Djokovic eliminated unseeded John Millman of Australia 6-3, 6-4, 6-4. Millman, who has won two Northern California Challengers (Sacramento in 2010 and Aptos in 2015) and reached the final of another (Tiburon in 2014), was coming off a stunning victory over Roger Federer. Djokovic, 31, is 14-2 against Nishikori, 28, with a 13-match winning streak. qualifier in the 2014 Bank of the West Classic at Stanford. Also Friday, No. 1 seed Rafael Nadal, the defending and three-time champion, will face No. 3 Juan Martin del Potro, who upset Federer for the 2009 U.S. Open title. Nadal, 32, is 11-5 against del Potro, who will turn 30 on Sept. 23. In their last meeting, Nadal prevailed 7-5, 6-7 (7), 4-6, 6-4, 6-4 in 4 hours, 28 minutes in the Wimbledon quarterfinals in July. Del Potro and Nishikori played in the now-defunct SAP Open in San Jose. Del Potro reached the quarterfinals as the second seed in 2009 in his only appearance in the tournament. Nishikori lost in the second round in all three of his appearances (2008, 2009 and 2011). Brad Gilbert of San Rafael in the San Francisco Bay Area coached him in 2011. In the men's doubles quarterfinals today, No. 3 seeds Mike Bryan (Stanford, 1997-98) and Jack Sock of the United States beat Maximo Gonzalez of Argentina and Nicolas Jarry of Chile 6-4, 7-6 (3). Bryan and Sock, the reigning Wimbledon champions, are scheduled to play No. 5 seeds Juan Sebastian Cabal and Robert Farah of Colombia on Thursday. Cabal and Farah, the Australian Open runners-up this year, defeated No. 15 Rohan Bopanna of India and Edouard Roger-Vasselin of France 6-3, 6-4. Two Northern California juniors were eliminated from the U.S. Open. Keenan Mayo, 18, of Roseville in the Sacramento area lost to No. 4 seed Nicolas Mejia of Colombia 6-3, 6-3 in the second round. And in the second round of girls doubles, Hailey Baptiste and Dalayna Hewitt topped fellow Americans Natasha Subhash and Katie Volynets, a 15-year-old resident of Walnut Creek in the Bay Area, 6-4, 7-6 (6).